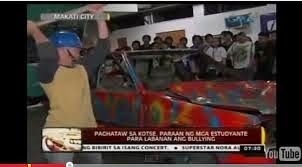 A unique project by the iAcademy school say students plunk down P10 for a 15-second smash session with an old car. Even Makati's chief of police hit the car with a hammer. Other than helping students release stress and anger, GMA's "24 Oras" reported that the funds taken from this project would fund Anti-Bullying Philippines' anti-hazing and anti-bullying programs. "It's really important that the students get [their anger] out, and in a way that's school-controlled," said Carlos Castaño, president of the advocacy group. Meanwhile, Makati Police chief Sr. Supt. 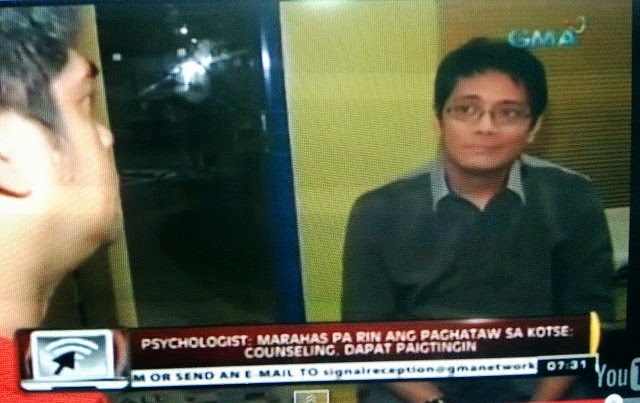 Manuel Lukban commented, "Sa pamamagitan nito, tunay na katapangan ang pinakikita mo. I-challenge ang sarili sa tamang pamamaraan." However, Dr. Randy Dellosa, while agreeing with the fundraiser's goals, said the method of releasing stress may end up hurting their advocacy. Stronger counseling programs, he said, may actually prove to be a better way of helping their cause. "Violence begets violence, and these are violent ways of trying to solve a problem. It may actually escalate the problem than solve it," Dellosa pointed out. A series of violent hazing incidents broke out in July, leading to one student from De La Salle - St. Benilde dead and one student from University of the Philippines - Diliman injured.